Bitcoin is next generation currency. A big shortcoming of Bitcoin is vulnerable to versatile way of loss because it's decentralized and circulated online. Hardware wallet is recognized as the safest solution for Bitcoin storage. Hardbit is a hardware wallet that thoroughly sheild the wallet from internet, thus maximizing Bitcoin safety. Read more in Products and Technology. Hardbit Bitcoin hardware wallet is a good choice for mid-high amount Bitcoin holder as a safety storage and payment solution. The latest version of HB01 enables backup file importation. This means 1 Hardbit can manage multiple wallets even from different holders. HB01M supports multiple cryptocurrency types--theoratically 256 types out of infinite is supported. Now Litecoin and Dogecoin are functional.New coin types will be continuously added. No matter how fancy software wallets are, they can't avoid the threat of hackers from internet. If not computer expert, playing with paper wallet,brain wallet is risky of losing Bitcoin by misoperations. Hardbit thoroughly shields your Bitcoins from internet thanks to independant hardware and QR-code only commincation. Hackers have no way to deal with you Bitcoins. It physically ensures Bitcoin safety. Hardbit provides backup function, so that even if the hardware wallet is broken or lost, you Bitcoins are still safe. Hardbit provide password portection, so that even your hardware wallet is lost, your Bitcoins won't be stolen. Most Bitcoiners install Bitcoin wallets in daily-used computers or smartphones. which tends to crash because of high working load. Non-experts will have very high risk of losing their Bitcoin while fixing these crashes. Hardbit only has one task-- Bitcoin wallet, so it's working load is very light, this guarantees the stability and therefore safety. Many Bitcoiners buy a computer that act as a hardware wallet. This do improve safety, but the investment is not small and it's not portable because of big size. If an emergent transaction is needed, they have to drive home. Hardbit is a hardware specially designed for Bitcoin wallet, it rules out a lot of computer hardwares that are not useful for Bitcoin, so it is small and price-friendly. It can be carried all the time, and transaction can be done at anytime. A Bitcoin transaction operated on Hardbit only needs 3 steps: scan the payment request, input password, show your transaction QR to receiver. This is not complex compared to software wallets on smartphone, and is more convienent compared to software wallets on computers. 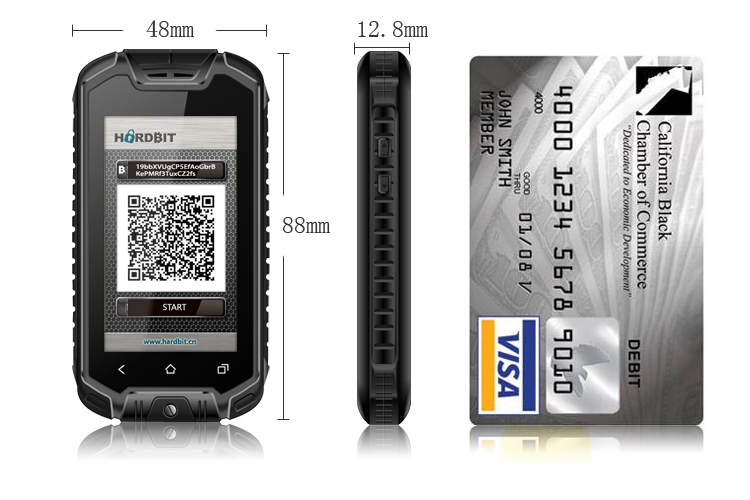 Because Hardbit can work offline, so it can act like bank cards for payment in shops. It enables immediate confirmation because double spending is avoided by changing the transaction broadcaster from payer to payee.